Section 1 – NAME The name of this association shall be “Concerned Auto Recyclers of Wisconsin” (CARS of WI). The association shall be a non-profit organization. The objective of which shall be set forth in Article 2. Section 2 – OFFICE The principle office of the association shall be located in the place of the President and/or any other place as may be designated by the board of directors. A. To promote legislation for the good of the recycler and the public, and to oppose legislation contrary to the good of the above. B. To improve the image of the association, and the industry which it serves. C. To promote awareness of the necessity of motor vehicles. D. To work toward improvement in business ethics and to encourage sound business practices. E. To promote street and highway safety. F. To cooperate with the national and the affiliated associations, whose purposes are similar to these. G. To keep members informed of new innovations that have been developed in the industry and to provide guidance for the implementation of same. H. To keep members informed of new safety and environmental standards to comply with state and federal guidelines. Section 1 – MEMBERS Membership shall be composed of any firm, individual, organization, partnership, or corporation engaged in and/or related to the automotive and/or truck recycling industry. Upon initial membership the board shall set membership fees and any special assessments deemed necessary. Members shall be terminated by cease of operation, voluntary withdrawal or expulsion. Membership and all rights therein are non-transferable and members may be expelled by a two–thirds (2/3) vote of the entire board of directors. Any expulsion decision by the board of directors may be appealed at the next regular meeting of the members, who shall then vote thereon and their decision shall be final. While appeal is pending, the member shall be considered as expelled and shall not have rights of a member of the association. DIRECT MEMBER A Direct Member shall be a State of Wisconsin licensed automotive recycling facility holding current storm water and freon permits. B. ASSOCIATE MEMBER An Associate Member shall be a firm, an individual, an organization or a corporation engaged in and/or related to the automotive and/or truck recycling industry or an automotive and/or truck recycling facility licensed in another state. Associate Members are entitled to all the privileges as the Direct Members except the privilege to vote and hold office. Section 1 – ANNUAL MEETING The annual meeting of this association shall be held in conjunction with the Upper Midwest convention. The agenda items are to include, but are not limited to, the treasurer’s annual report, all committee annual reports, and election of board members. Section 2 – SPECIAL MEETINGS Special meetings of the members may be held at any time at the call of the President of a majority vote of the board of directors. Section 3 – NOTICE OF MEETINGS Notice of all meetings setting forth time, place and purpose, shall be given in writing to each member appearing on the books of the association secretary, or in the absence of the secretary, by the President, at least seven (7) days prior to the date of such meeting. Section 4 – WAIVER OF NOTICE Waiver of notice shall be in accordance with Chapter 18, Wisconsin Statutes. Section 5 – INFORMAL ACTIONS Any actions required or permitted by the articles of incorporation or by-laws may be taken without meeting if consent in writing, setting forth the action so taken, shall be signed by all members entitled to vote with respect to the subject matter thereof. Section 6 – QUORUM Eleven (11) members in good standing shall constitute a quorum for the transaction of all regular and special meetings. Section 7 – RULES OF ORDER The meetings and proceedings of this association shall be regulated by its board of directors, except as may otherwise be prescribed by these by-laws, and shall conform to Roberts Rules of Order. Section 1 - ENTITLEMENT Each Direct Member in “Good Standing” of this association shall be entitled to one (1) vote. The representative shall present to the board of directors the authority to vote proxies prior to any vote. Election of directors and/or officers by members may be conducted by mail. Section 2 - PROXIES A proxy vote may be cast provided the proxy is executed in writing by the member or his duly authorized attorney-in-fact. No proxy shall be valid after 11 months from date of its execution, unless otherwise provided in the proxy. Section 1 – MEMBERSHIP DUES The annual dues of the member of this association shall be an amount such as determined by the board of directors and shall entitle such members to the bulletins and newsletters sent to all members, in addition to unrestricted access to the association website. Section 2 – ANNUAL ASSESSMENTS If the board of directors shall determine that annual assessments shall be necessary to properly carry on the activities of this association and to accomplish its objectives, then and in that event, the board of directors may take such actions as it deems advisable at any regular or special meeting. Section 3 – MEMBERSHIP STANDING Unless annual dues are received within 120 days from yearly assessment date, member will be considered “not in Good Standing”. Annual dues may be paid in installments as directed by the board of directors. Should any member pay the membership dues called for in Section 1, but not pay the annual assessments as authorized by the board of directors, then, and in that event, the member shall not be a “Member in Good Standing”, but shall remain a “Member” of the association. Section 1 – GENERAL POWERS The corporate powers, businesses and property of this association shall be exercised, conducted and controlled by a board of directors. The board of directors shall determine the policies and carry out objectives of this association. In so doing, the board of directors and/or officers shall appoint committees to accomplish and carry out the policies and objectives as directed. The governing board of the association shall consist of a board of directors and the elected officers. Job descriptions shall be written for the officers and all committee chairs. QUALIFICATIONS OF A DIRECTOR A director shall be a selected representative of a direct member of the association in “Good Standing”. There can be a maximum of two (2) director from each direct member, serving on the board of directors at one time. B. TERMINATION OF A DIRECTOR In the event of termination of employment of the representative of the direct member, his/her directorship will be dissolved. In that event, the direct member involved can select another representative, who must be approved by majority vote at the next board of directors meeting. Section 2 – TENURE, NUMBER AND QUALIFICATIONS Each director shall serve a three (3) year term. A director elected to the presidency in his/her third year shall remain an active board member for one (1) year after his/her term expires. Each director shall hold office until their term expires or a successor had been elected. Resignations must be received by the President, in writing, ten (10) days prior to the next regularly scheduled board of directors meeting. A director, who has missed three (3) consecutive meetings of the board of directors, shall be automatically relieved of his term as director. A director may also be removed from office by affirmative vote of a majority of the association members entitled to vote for the election of such director, taken at any special meeting of the members called for this purpose. Section 3 – Except as otherwise provided, five (5) directors shall constitute a quorum for the transaction of business at any meeting of the board of directors, but a majority of the directors present (though less than such quorum) may adjourn the meeting from time to time without further notice. Section 1 – NUMBER The principal officers of the association shall be a President, a Vice-President, a secretary and treasurer, each of whom shall be elected by the board of directors from within its ranks, no two (2) offices shall be held by the same person. An officer of this association shall be a member in “Good Standing” for two (2) years and have served on the board of directors for one (1) of those two (2) years. Section 2 – ELECTION AND TERM OF OFFICE The officers of the association shall be elected by the board of directors at their first meeting held after each annual meeting. If the election of officers shall not be held at such meeting, such election shall be held as soon thereafter as is convenient. Each officer shall hold office until his term expires or a successor has been elected. The President and Vice–President shall serve for a period of two (2) years, terms shall start on alternating years. The secretary and treasurer shall each serve a two (2) year term. All outgoing officers must attend the first board meeting held following the end of their term to facilitate transfer of property and information even though their services, along with their voting privileges, have expired. Section 3 – REMOVAL Any officer or agent elected or appointed by the board of directors may be removed by the board of directors whenever in its judgment the best interest of the association will be served thereby, but such removal shall be without prejudice to the contract rights, if any, of the person so removed. Election or appointment shall not of itself create contract right. Section 4 – VACANCIES A vacancy in any principal office because of death, resignation, removal disqualification or otherwise, may be filled by the board of directors for the unexpired portion of the term. Section 1 – CONTRACTS The board of directors may authorize any officer or officers, agent or agents, to enter into any contract or execute and deliver any instrument in the name of and on behalf of the association, and such authorization may be general or confined to the specific instances. Section 2 - LOANS No loans shall be contracted on behalf of the association and no evidences of indebtedness shall be issued in its name unless authorized by or under the authority of a resolution of the board of directors. Such authorization shall be confined to specific instances. Any indebtedness shall also be subject to such rules as described in the board of director’s job descriptions. Section 3 – CHECKS, DRAFTS, ETC. All checks, drafts, or other orders for payment of money, notes or other evidence of indebtedness issued in the name of the association shall be signed by such officers, a minimum of 2 (two) signatures are required per document, of the association and in such manner as shall from time to time be determined by or under the authority of a resolution of the board of directors. Section 4 – DEPOSITS All funds of the association not otherwise employed shall be deposited from time to time to the credit of the association in such banks, trust companies, or other depositories as may be selected by the board of directors. Section 5 – SPENDING LIMITS Officers, members or agents of Concerned Auto Recyclers of Wisconsin shall have the authority to spend or commit this association’s funds subject to such rules prescribed by the Board of Directors’ job descriptions. The fiscal year of the association shall begin on the first day of January and end on the thirty-first day of December in each year. The by-laws may be altered, amended or repealed and new by-laws may be adopted by the members at any annual or special meeting of the membership at large. The job descriptions for the officers and committee chairs may be altered, amended or repealed as the majority of the board of directors deems necessary. 1. Supervise and control all business affairs of C.A.R.S. 2. The President shall have authority to issue checks, drafts, orders for payment, or incur indebtedness within the following limits: $0-$300.00, presidential approval; $301.00 - $500.00, prior majority executive committee approval; $501.00 and over, prior majority board approval. 3. Preside at all meetings. 4. Provide the secretary with an agenda (as decided along with the VP) for the next board meeting two weeks prior to the scheduled meetings. 5. Sign all documents necessary for C.A.R.S. business. 6. Update, maintain and supervise officer and committee responsibilities. 7. Receive all ARA publications and inform the board of directors and membership of all important information. 8. Authority to delegate and assign duties and responsibilities as he shall deem necessary, subject to the rules as prescribed in the by-laws. 10. Coordinate representation with the Department of Natural Resources when needed. 11. Provide the Newsletter Committee with 3 articles per year for the newsletter. 1. In the absence of the president, preside at all meetings. 2. Supervise all business when needed. 3. Stay abreast of all legislation. 4. Provide input regarding board meeting agenda to the President three weeks prior to next board meeting. 5. Provide the Newsletter Committee with 3 articles per year for the newsletter. 1. Have charge, custody of, and be responsible for all funds of C.A.R.S. 2. Receive and give receipts for monies due and payable in accordance with by-laws. 3. Email General Fund bank statement monthly to the board. 4. Forward current, monthly, detailed debit and credit reports to secretary two weeks prior to next board meeting. 5. Provide the board with a detailed annual report. 6. File yearly tax returns. 7. File Lobby Logs bi-annually. 8. Be responsible for the Conduit Fund record keeping. 1. Study proposed legislation to determine possible effect to our industry. 2. Plan and coordinate with our Legislative Committee any necessary meetings or plan of actions. 3. Contact and confer with members of legislature and other public officers to; persuade them to support legislation in our best interest, provide information to help defeat or amend unfavorable legislation and educate them so they may be able to introduce legislature that would be more favorable to our interests. 4. Contact groups or individuals having the same interest, in order to encourage them to contact legislators and present their views. 5. Provide information and education to our members on the lobbying procedures and techniques. 6. Provide a report for each C.A.R.S. meeting. 7. Attend C.A.R.S. meeting or events when needed. 8. Assist organization in regards to C.A.R.S. of WI Conduit. 1. Keep the minutes of meetings in one or more books provided for that purpose. 2. Assist as needed when the paid Secretary is unable to perform his/her duties. 1. See that all notices are given in accordance to by-laws or as required by law. 2. Update and maintain C.A.R.S. library. 3. Maintain and update an inventory control list of the C.A.R.S. association. 4. Keep a register of the postal address of each member which shall be furnished by each member. 5. Have general charge of the membership books of the association, including updating current membership list. 6. Collect and forward membership dues to treasurer. 7. Forward the detailed C.A.R.S. incurred operating expenses and monies collected to treasurer for payment and deposit. 8. Compile the minutes and financial report from the previous meeting, along with the agenda for the next meeting and send to all board members one week prior to next board meeting. 9. Purchases of supplies needed for day to day operations, such as paper, postage or reordering of supplies previously approved would not fall under the following restrictions, providing the total purchase price is under $100.00. Prior approval would be required for any equipment updates, regardless of cost, or new lines of items not already approved, subject to the following limits: $0 to $300.00, prior presidential approval; $301.00-$500.00, prior majority executive committee approval; $501.00 and over, prior majority board approval. 10. Arrange meeting sites and necessities for meetings. Date, agenda, location, speakers, topics of interest, mailing schedule and finances are to be decided upon by the board. 1. Organize, assign, and supervise specific subcommittees and their duties. 2. Responsible for the floor plan, including signage, electrical, tables, seating, stages, tents, heating, A/V equipment, pipe and drapes, lighting, clean up, food and beverage, etc. 3. The contact person for the hotel/convention site. 4. Responsible for all printed materials. 5. Submit a detailed projected budget prior to convention process for board approval. 6. Schedules and presides at all convention planning meetings. 7. Oversees times and dates of all mailings. 8. Collects all fees from other convention committee chairpersons and forwards to the treasurer. 9. Schedule and preside a follow-up meeting to provide a final detailed financial report, an overview discussion, and reports from each subcommittee, new ideas/concerns. 2. Organize, design, and assemble a “vendor packet” and preliminary mailing information. 4. Four months prior send preliminary vendor information mailing to potential vendors. 5. Three months prior send out convention “vendor packets”. 6. Organize others to do follow up calls two months prior. 7. Organize others to do follow up calls as needed one month prior. 8. Be available during trade fair set up/tear down times. 9. Work with Convention Chairperson regarding vendor program advertisements. 10. Communicate donation/sponsorship information to Donation Chairperson. 11. Provide board with a follow up report after convention. 1. Contact, schedule, negotiate and finalize speaker contracts. 2. Arrange for necessary equipment and fulfill requests per contract. 3. Make the necessary lodging and travel arrangements as per contract. 4. Obtain speaker biography information. 5. Submit final bills and oversee his acknowledgement. 6. Provide the board with a follow up report after the convention. 2. Organize and design activity promotional materials and signs. 3. Coordinate floor plan with Convention Chairperson. 4. Record and collect fees and pay out activity monies. Forward report and money to Convention Chairperson. 5. Use and forward Donation Acknowledgement Forms as needed. 1. Distribute and make available the Donation Acknowledgement Forms. 3. Organize donation solicitation as needed. 4. Designate additional auction item purchases if necessary, funded through_________. 5. Collect and display auction items. 6. Arrange for an auctioneer, assistants and necessary equipment. 7. Provide the auctioneer with the necessary information regarding items, so that he may promote them and give proper recognition when appropriate. 8. Coordinate floor plan with Convention Chairperson for needed space. 9. Record and collect auction bids, forward fees collected to Convention Chairperson. 10. Send personalized acknowledgements using the information provided on the Donation Acknowledgement Form. 11. Provide the board with a follow up report after the convention. 1. Designate purchases of beverages, snacks, utensils, etc. 2. Coordinate room/space with Convention Chairperson. 3. Set up and maintain hospitality room. 4. Clean up hospitality room and distribute leftovers as needed. 5. Promote and provide recognition through announcements, posters, information packets, etc. 6. Use and forward Donation Acknowledgement Forms as needed. 1. Work with Convention Chairperson for information to organize, design and assemble convention registration materials. 2. Organize and set up registration table, signs, and other necessary items needed. 4. Assign volunteers to work registration table and provide them with the necessary information. 5. Record registrations, collect fees and forward fees collected to the Convention Chairperson. 6. Prepare and mail convention materials as scheduled. 7. Provide the board with a follow up report after the convention. 1. Develop an awareness of what our industry consists of, among ourselves and to the general public. 2. Develop new ideas to continue to offer educational opportunities and information to our members. 3. Maintain, promote, and hold the Regional Recyclers Program throughout the state. Develop additional phases as needed. 4. Provide the Newsletter Committee with a 3 articles per year for the newsletter related to education. 5. Attend individual committee sessions prior to board meetings as scheduled by the Chairperson. 6. The Committee Chairperson has the authority to organize and delegate specific related duties to its committee members as needed. 7. Any and all financial commitments need prior presidential approval subject to presidential limits or prior majority board approval. 8. Major final decisions need prior board approval. 9. It is the responsibility of the Chairperson to see that these guidelines are carried through. 1. Provide members with updated insurance information concerning recycling so members can make informed decisions. 2. Inform members of current insurance news, trends, and topics. 3. Provide members with business contacts regarding possible insurance options. 4. Provide the Newsletter Committee with 3 articles per year for the newsletter related to insurance. 5. Attend individual committee sessions prior to regular board meetings as scheduled by the Chairperson. 1. Coordinate the communication between our hired lobbyist and our members. 2. Keep our members informed regarding the latest legal issues. 3. Develop ways for our members to easily support or oppose the necessary legislation that affects our industry. 4. Schedule membership representation at related political gatherings as needed. 5. Provide membership with a current regional political representative list. 6. Provide the Newsletter Committee with 3 articles per year for the newsletter related to legislation. 7. Attend individual committee sessions prior to board meetings as scheduled by the Chairperson. 8. Committee Chairperson has the authority to organize and delegate specific related duties to its committee members. 9. Any and all financial commitments need prior presidential approval subject to presidential limits or prior majority board approval. 10. Major final decisions need prior board approval. 11. It is the responsibility of the Chairperson to see that these guidelines are carried through. 1. Continue to promote the benefits of being a C.A.R.S. member. 2. Set yearly realistic goals for increasing membership count. 3. Contact and encourage renewals to maintain current membership. 4. Develop and implement new ways to increase membership. 5. Collect and publish a new member profile for the newsletter. 6. Work with secretary to keep an updated list of members and all licensed salvage yards. 7. Compile, publish, and distribute yearly membership booklet by May 1st to all current members. 8. Maintain and update information and supplies for “New Membership Packet”. Distribute as needed. 9. Provide the Newsletter Committee with 3 articles per year for the newsletter related to membership. 10. Attend individual committee sessions prior to board meetings as scheduled by the Chairperson. 11. The Committee Chairperson has the authority to organize and delegate specific related duties to its committee members as needed. 12. Any and all financial commitments need prior presidential approval subject to presidential limits or prior majority board approval. 13. Major final decisions need prior board approval. 14. It is the responsibility of the Chairperson to see that these guidelines are carried through. 1. Collect and publish information provided from our association chairpersons and other members. 2. Collect new articles and advertisements related to our industry to provide our members with important information about our industry. 3. Solicit sponsors and donations to subsidize newsletter costs. 4. Publish, prepare and mail a bi-monthly newsletter. 5. Set a regular, consistent schedule for article deadline and mailing dates. 6. Keep and maintain a current board approved mailing list. 7. Provide the board with a detailed bi-monthly newsletter expense report. 8. Attend individual committee sessions prior to regular board meetings as scheduled by Committee Chairperson. 9. The Committee Chairperson has the authority to delegate and organize specific related duties to its committee members as needed. 10. Any and all financial commitments need prior presidential approval subject to presidential limits or prior majority board approval. 11. Major final decisions need prior board approval. 12. It is the responsibility of the Chairperson to see that these guidelines are carried through. 1. Develop and implement ideas to promote a positive awareness regarding our industry to others and ourselves. 2. Assess, develop and implement the need and possibilities for the association as a whole to be involved with various promotional products, supplies, sponsored events, advertisements, etc. 3. Develop and provide updated information to be used in the “New Membership Packet”. 4. Provide the Newsletter Committee with three articles per year for the newsletter related to promotion. 6. Committee Chairperson has the authority to organize and delegate specific related duties to its committee members. 1. Inform members of current recycling news, trends and topics. 2. Work closely with the Legislative Committee in order to update members on new legislative issues regarding recycling. 3. Provide members with information regarding Best Management Practice ideas. 4. Provide members with business contacts regarding updated core and recycling information. 5. Provide the Newsletter Committee with 3 articles per year for the newsletter related to recycling. 6. Attend individual committee sessions prior to regular board meetings as scheduled by the Chairperson. 7. The Committee Chairperson has the authority to organize and delegate specific related duties to its committee members as needed. 8. Any and all financial commitments need prior presidential approval subject to presidential limits or prior majority board approval. 9. Major final decisions need prior board approval. 10. It is the responsibility of the Chairperson to see that these guidelines are carried through. 1. Maintain and distribute scholarship applications. 2. Solicit and organize ideas/events to increase the scholarship fund. 3. Communicate with the Treasurer regarding payments and funds. 4. Review and award scholarships. 5. Coordinate and communicate necessary information to applicants. 6. Provide the Newsletter Committee with 3 articles per year for the newsletter related to scholarships. 7. It is the responsibility of the Chairperson to see that these guidelines are carried through. 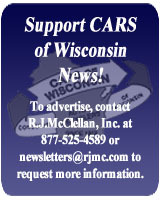 The WI CAR Consultant is under contract with Concerned Auto Recyclers of Wisconsin and is under the supervision of the CAR Program Committee. 1) Develop and maintain a manual for the program. 2) Attend CARS of WI functions when needed. 3) Provide pertinent information and resources to members. 4) Educate members on the required standards. 6) Maintain a current certified member list. 7) Provide the necessary documentation to the ARA as required. 8) Assist the committee in developing and implanting CAR program marketing plans and materials. 9) Communicate the necessary information with the CARS of WI secretary and/or the Committee Chairperson.